When you talk to folks about one-word-birds – which I do as frequently as possible – they look at you with a puzzled expression, then start naming all the one-word-birds they can think of. This seems like an entertaining little game at first, but I’m quickly growing tired of crushing dreams. Is that a little over-dramatic? Maybe. But a person’s eyes light up when they think of their first one-word-bird, and it pains me every time I have to tell them that they’re wrong. You see most birds that people refer to by one-word names are not actually one-word-birds. The cardinal at your feeder is actually a Northern Cardinal, the goldfinch an American Goldfinch, the junco a Dark-eyed Junco and so on. We often learn birds by their simple, colloquial names, but official nomenclature insists on a little more formality. The problem is even worse in certain parts of the world. British bird-nerds, for example, see themselves as the originals and so dispense with any qualifiers when referring to their native avifauna. There is only one wren in all of Europe so the Brits simply call it “Wren” even though the world is full of wrens, all of whom have multi-word names1. The same is true of their Blackbird, Redstart, Robin and so on. If there was a prize for the bird most suggested by people who’ve begrudgingly listened to me yammer on about one-word-birds, it would most certainly go to the ostrich. It’s easy to see why this seemingly-singular bird would be the quickest to mind for so many. It is the largest2 bird in the world, and is one hell of a thing to look at. It would certainly deserve a one-word name, if only there weren’t two of it…er, them. Sadly in 2014 the Common Ostrich was separated from the similar but not-similar-enough Somali Ostrich, the latter differing from the former primarily in that its skin is blue instead of pink. 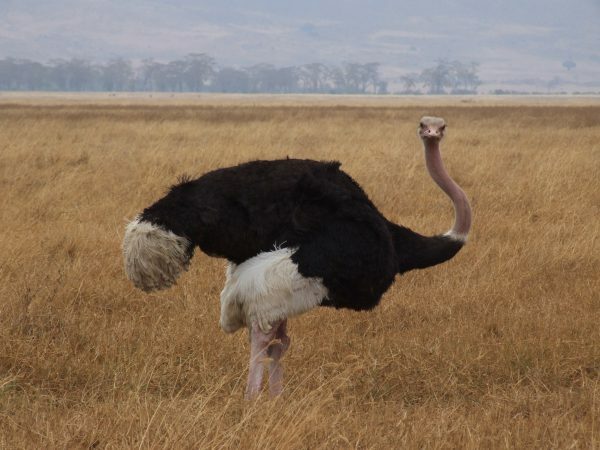 The Common Ostrich lives in much of Africa while the Somali Ostrich resides in…you know, you probably get it. The point is that ostriches of a different hue get assigned to different species, and thereby excluded from the one-word-birds list. Much could be written about the ostrich(es), but I’ll just leave you with this direct quote from Wikipedia: “When attacking a person, common ostriches deliver slashing kicks with their powerful feet, armed with long claws, with which they can disembowel or kill a person with a single blow.” Just keep that in mind the next time you visit the local ostrich farm. Perhaps number two on the most-suggested list, the kiwi would be a hot contender for one-word-birds if there weren’t FREAKING FIVE OF THEM. How did I not know this?? Who has been hiding all the kiwis?? As I’m sure you already know, the kiwis of the world include the Okarito Brown Kiwi, Great Spotted Kiwi, Southern Brown Kiwi, Little Spotted Kiwi and North Island Brown Kiwi. All are endemic to New Zealand3, flightless, brown and super duper weird. There are two things you need to know about a kiwi, really. The first is that they have a great sense of smell, which is fairly odd for a bird. Their nostrils are at the end of their long beak, which they probe into the ground in search of worms and other invertebrates. 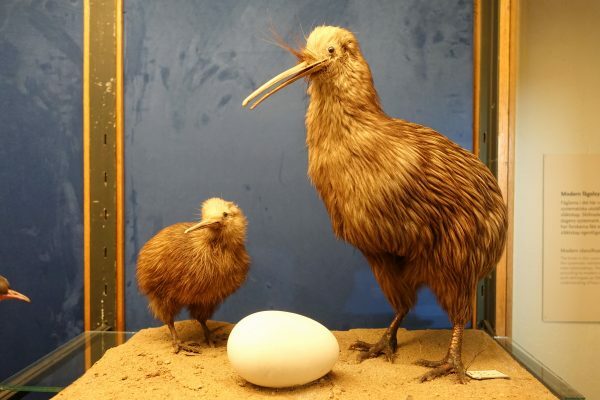 The second – and by a long shot, weirder – thing you should know is that kiwis have the largest egg-to-body-size ratio of any bird. The bird itself is the size of a chicken, but the egg is six times larger than a chicken egg and can weigh up to a quarter of the bird’s body weight. The female must consume vast quantities of food to fuel the development of this outrageous ovum, but as it reaches its full size the egg actually takes up so much space in the body that the bird can’t fit any food in there and must go hungry until the egg is laid. How the kiwi performs this final, horrifying task I do not know, but I’ve heard it described as a human woman giving birth to a six-year-old, so you’re welcome for that visual. Incredibly, this is not a joke. Kookaburra sounds like a perfect one-word name if I’ve ever heard one, but here again we are confronted with five species: the Laughing, Spangled, Rufous-bellied, Blue-winged and Shovel-billed Kookaburras. These banal but necessary descriptors mar an otherwise excellent name, and kookaburra is apparently derived from an Australian Aboriginal word for these birds which is an onomatopoetic representation of their call. 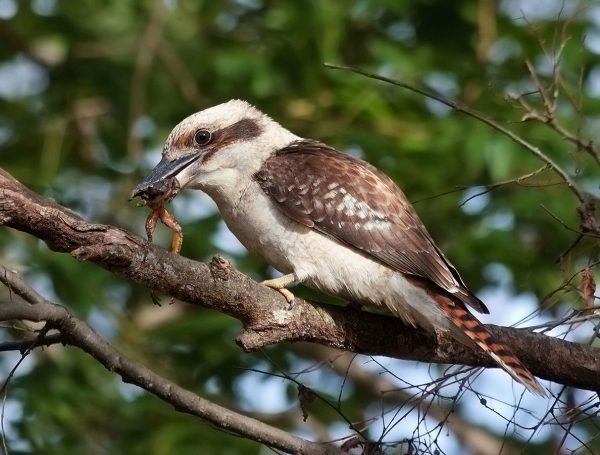 The cackle of the Laughing Kookaburra will be instantly familiar to anyone who has watched a movie set in Australia. Their odd name may lead you to believe the kookaburras are likewise unusual, but truthfully they’re just five of the world’s 114 kingfishers. Unlike many of those species they rarely feed on fish, but hunt terrestrially for rodents, reptiles, amphibians, insects and other small animals. A side-note for all you true bird-word-nerds out there: four of the kookaburras belong to the genus Dacelo. That name was coined in 1815 by an English zoologist named William Elford Leach, because it is an anagram of the Latin word Alcedo, meaning kingfisher. Alcedo is also a genus of kingfishers. Aren’t words neat? Did you grow up watching Road Runner cartoons? I did. It saddens me to think that many children raised on Looney Tunes probably go through their lives entirely unaware that there is actually a real bird called the roadrunner. Well, two real birds, to be precise. 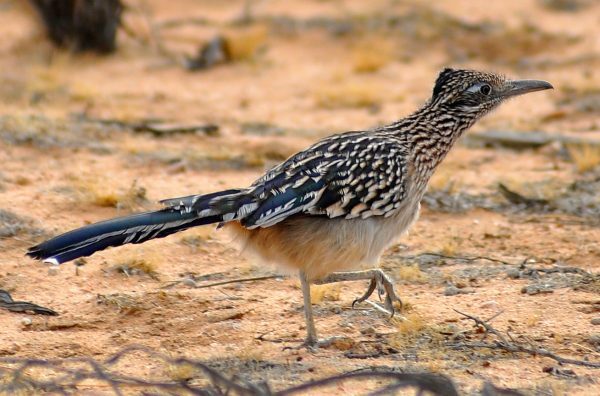 The Greater and Lesser Roadrunners are truly bizarre birds. They are technically cuckoos, and as their name suggests they are ground-dwelling and fast-running. They can fly, but they’re not big on it. Observed closely, the roadrunners give an altogether reptilian impression. Their scaly facial skin, powerful legs and businesslike gait at speed call to mind what a small, bipedal, feathered dinosaur like Velociraptor may have looked like. Then again, a roadrunner is a small, bipedal, feathered dinosaur so I suppose that’s apropos. The roadrunners use their impressive speed and agility to hunt all manner of terrestrial prey, including insects, reptiles, rodents and small birds. Their specialty seems to be particularly hazardous quarry, and they are known to hunt rattlesnakes, tarantulas, scorpions, centipedes and hawk wasps. Meep meep indeed. Ok, so I admit that this is not a bird people suggest to me for the blog. I imagine most people couldn’t picture a capercaillie, although some may remember it as the bird that tackled David Attenborough4. It is, however, a bird I was excited to write about, partially because I have a soft spot for grouse and partially because the name just sounds cool. Unfortunately for me, there are two species of capercaillie: the Western Capercaillie and the Black-billed Capercaillie5. 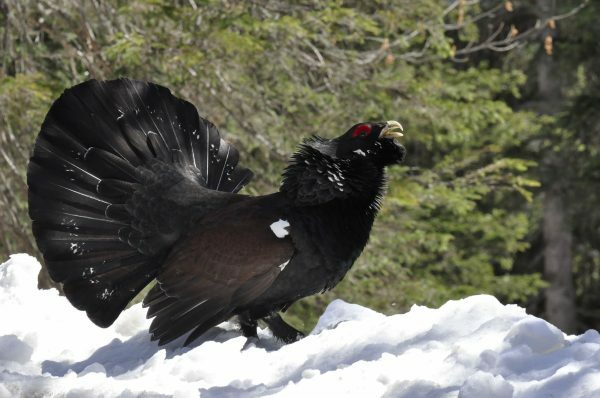 The Western Capercaillie in particular is the largest of all grouse, weighing up to a whopping 16lbs. As with many grouse its mating display is its main appeal, and males compete for females in spectacular fashion. The name that caught my attention is of gaelic origin, and apparently means “wood horse”. Interpret that as you will6. Scottish people are weird. You’d better believe this bird means business. 1The European bird is properly called Eurasian Wren. 5The latter has never attacked David Attenborough, to the best of my knowledge.